Dynamic Plates, by Vincenzo Pascucci, is the perfect app for any science teacher to have on their device; it is available for iOS and Android. Beginning in middle school, students start learning about the tectonic plates and the Pangaea concept. (By the way – Pangaea means universal earth in Greek.) This app opens with the Plate Tectonics Theory and talks in easy terms about Alfred Wegner and his observations as a geophysicist and his belief (way before his time) that originally the continents were once a single land mass that drifted apart. Students will learn the meaning of word tectonic, of a builder, in Greek – “tektonikos”. This app gives several other explanations using Greek terms, which is very helpful. The idea that the continents once all fit together like a jigsaw puzzle is illustrated clearly, first in a moving globe, and again in four separate globes showing the continental drift from the Pangaea to today. Excellent diagrams show how fossil bones were found where the continents once fit together, along with geological and paleoclimatic evidence. Important vocabulary is highlighted and tapping will bring you to a full-page illustration to accompany the terms. This app has it all, and it is extremely well done with accurate information and wonderful interactives to bring the topic alive. Luckily for me, Dynamic Plates came to our attention just in time! My 8th-grade students were just beginning this unit of study, and they loved it! Dynamic Plates is deep, no pun intended, the longer you stay with it the deeper you go! 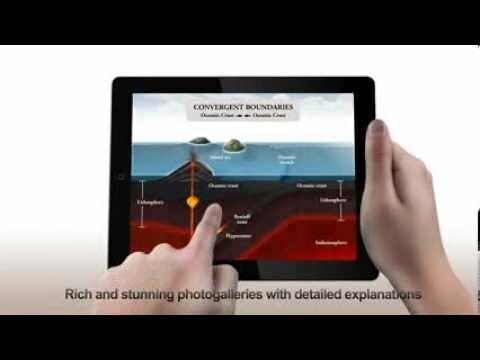 Dynamic Plate is an educational interactive app that lets you observe and understand the internal dynamics of the Earth. In Dynamic Plates, you’ll find 7 wonderful interactive animations. Drag the plates and… see what happens! You will be able to recreate what nature performs over millions of years, observing (and listening) the forms and phenomena produced by plate tectonics. - A rich and stunning photo gallery with detailed explanations. - Geolocation of the places and described events. - The explanation of interactive animations. - The history of the plate tectonics Theory. - Original drawings and thematic maps. - Interactive test for evaluating knowledge. - Sharing results on Facebook. As far as sharing results on Facebook, we suggest making this an optional setting. Many schools do not support the social networks. This app comes in four languages, English, Italian, German and French, making it accessible to many students.